The plants offered here are divisions from the original plant, not meristem clones. One of our favorite late-blooming pendant Cymbidiums for its beauty, floriferousness, and light sweet fragrance. 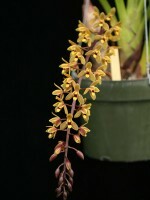 Often the last Cymbidium to drop it's flowers (mid-July last year! 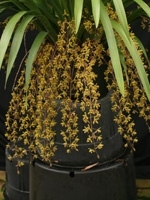 ), and a specimen can have over 20 spikes in a six inch pot. 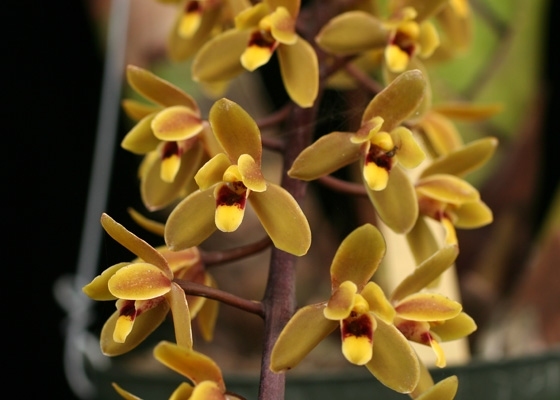 From the primary cross between Cymbidium maddidum and Cymbidium suave. .Temperature Tolerant. May-June blooming.